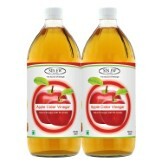 Amazon India is Selling Sinew Nutrition Apple Cider Vinegar, 350ml (Pack of 2) Rs. 169 which is worth for Rs 489 Best and lowest price online.Free Shipping for Prime Users. Activate your prime account .You can follow the below steps to buy this product at their deal price.Keep Visiting dealsheaven.in for more Best offers ,hot online deals, promo code, coupons and discount . Pure With Goodness Of Mother Vinegar Naturally Fermented Himalayan Apple Juice with 5% Acidity Made with Himalayan Natural Apple Juice Naturally Fermented Best Quality Vinegar Rich in Natural Components. Benefits 1. How to buy Sinew Nutrition Apple Cider Vinegar, 350ml (Pack of 2)?